I have a bit of a tab problem. Just now I have 31 tabs open in Chrome. I could tell you I’m going to get that under control, but that would be a lie. I like the way Chrome handles tabs but they do eat up a lot of memory if you have a ridiculous number of them open. 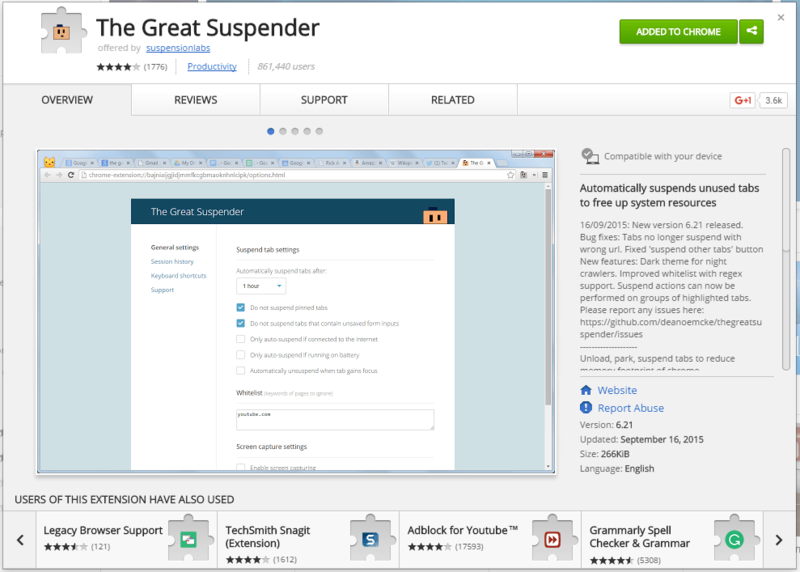 Fortunately, my problem is so common that there’s a Chrome extension to fix it: The Great Suspender. The Great Suspender does what you would expect from the name, it suspends your inactive tabs by doing some sort of magic that unloads your page but saves the url so you can reload it almost instantly when you’re ready. You can manually suspend tabs that you know you won’t use for a while or you can let it automatically suspend them when they’ve been inactive for long enough. It’s been great for memory usage and I really like not having to wait for all my tabs to load every time I restart Chrome. If you’ve given up on controlling your tab habit, give The Great Suspender a try. And donate a couple bucks to the creator if it helps you. Postman lets you easily test your REST endpoints by letting you name and save your calls and add them to collections. You can save your authentication data too and you can parameterize your calls so you can test the same call on local and then staging by just switching environments in the dropdown. Another really cool thing Postman added lately is the ability to sync your account across different computers. If you work from home sometimes and curse yourself for not exporting your calls and sending them to yourself (not that I ever do that), you’ll love that feature. If Postman isn’t your thing, there are plenty of other apps for REST testing. Insomnia, for example, was built by a local! I recently started using StayFocusd and it rocks! StayFocusd is a productivity tool that stops you from visiting websites where you waste time. Whatever your timesinks are (for me feedly and reddit are some of the worst), you just add them to StayFocusd’s blocklist and after 10 minutes (or whatever time you set), it blocks them. By default it also blocks links that you clicked while on a site in your block list. For example, if you follow a link from reddit, that still counts toward your 10 minutes of browsing for that day.